The River Ure is a typical clean river of the Yorkshire Dales National Park and is rich in wildlife, insect life and many species of birds. Fishermen love this river for its brown trout and grayling. The nationally rare native white-clawed crayfish can also be found. Bainbridge is a lovely village with a large green situated at the head of Raydale near the confluence of the River Bain with the River Ure. The village lies within the Yorkshire Dales National Park and is over looked by the distinctive flat topped hill of Addlebrough which is the site of an Iron Age fort and not far away is Stoney Raise Cairn one of the largest cairns in Yorkshire. The very well preserved Roman Road (Cam High Road) runs from the Roman Fort at Bainbridge skirting Wether Fell to Ingleton. In the late 18th century the road was resurfaced and formed part of the Richmond to Lancaster turnpike Hills. Semer Water is the second largest natural lake in North Yorkshire after Malham Tarn. It is half a mile long covers 100 acres and lies in Raydale. Semer Water has been painted by many artists the most famous being JMW Turner who visited the lake on 26th July 1816. The Legend of Semer Water is that the area was a prosperous city and one night a beggar came in search of food, drink and shelter but every house turned him away. Eventually he came to a hovel of a poor couple just outside the town who took him in and treat him with great kindness. Next day when the beggar left he faced the town and uttered the curse “Semerwater rise and Semerwater sink and swallow the town all save this house where they gave me food and drink”. As soon as it was said the waters of the lake rose up and flooded the city, drowning the proud inhabitants and leaving only the hovel of the poor couple on the hillside unscathed. Another legend tells how the Carlow stone arrived at Semer Water when a Giant on Addlebrough and the Devil on a neighbouring Crag had a fight and threw stones at each other. The River Bain is just 2½ miles long making it the shortest named river in England it rises in Semer Water and flows down to meet the River Ure just north of Bainbridge. For the last mile the river runs through the steep sided valley dropping a 140 ft then passes to the east of Bainbridge, running between the village and Brough Hill the site of a Roman fort. The river also powers Low Mill, on the eastern side of Bainbridge, with its restored water wheel. Marsett is one of the three settlements based around Semer Water in the Richmond district of North Yorkshire the other two being Countersett and Stalling Busk. It is an attractive hamlet just to the south west of the lake. 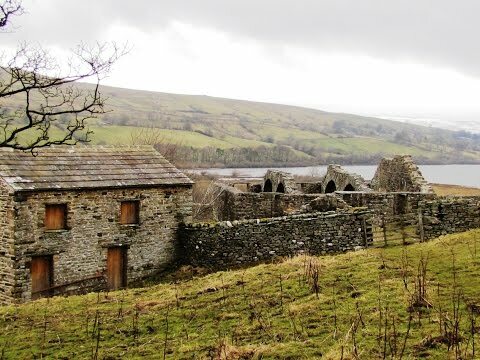 Stalling Busk, in the small dale of Raydale, lies immediately south of Semer Water and has two churches St. Mathew’s in the village and another ruined one a short walk away towards Semer Water. The ruined Old Church built on common land was the original church of Stalling Busk dating from around 1722 and was still in use in the early 20th century. In the early years it was a chapel of ease. The new church of St. Mathew was built in 1908 and the Old Church soon fell into disrepair and was stripped of its roof and furnishings. We park at the side of the road near the Rose and Crown Hotel and walk slightly uphill on the little side road past the school and church. We follow the road for just over half a mile until the road bends sharply to the left here we leave the road and head straight forwards on the track, this is the old Roman Road (Cam High Road). We keep following the track uphill for 1.5 miles until we meet a small road called Four Lane Ends. The track continues on the other side of the road (optional: but we turn right and walk the road downhill to a small bridge to view a waterfall then head back uphill and continue along the Roman Road). We head forwards a short way and take a detour through a gate on the right to view Horton Gill Force, another waterfall on the right. We head back to the track and continue forwards uphill for just under a mile until we see two footpath signs one either side of the track. We turn left leaving the Roman Road and follow the Marsett sign through the wall and head uphill to the dip in the skyline where we go through a gate. We walk along the top through an area of disused quarries and shake holes then head downhill through the fields, Marsett can be seen down below in the distance. At the bottom we go over a stile turn left onto a track then at the road turn right and go over the bridge into Marsett. We turn immediately left after the bridge and follow the track sign posted Stalling Busk with Marsett Beck on the left. After a short way we follow the track as it bears right, away from the beck, then head forwards over two small foot bridges. At the second bridge bear slightly left then forwards uphill passing a barn on the left towards the farm about two thirds of the way up. Near the top we go through the gate on the right and turn left to follow the track uphill. On reaching the church we turn left and follow the track between the lower houses of Stalling Busk. After a short way we turn left at the sign post for Ruined Church ¼ mile and head downhill and follow the track over a small footbridge and through two gates. The ruins of the old church are on the left and Semer Water is just beyond. We go through the gate and wander around the ruins then back through the gate and turn left. We head forwards through the fields then walk along the path at the side of Semer Water. The path passes between a barn and a wall on the right then almost immediately over a stile and keep heading forwards until we meet the road. We turn left along the road to the head of Semer Water where there is a parking area and a seat where JMW Turner sketched for his painting of “Simmer Lake”. We continue on the road and turn right just before the bridge and follow close to the River Bain on the left. We eventually head slightly away from the river pass through two walls then to the left of a barn through another wall and heads forwards over the hill in front of us. At the top we go through a gate and head downhill towards Bainbridge in the distance. When we reach the small road we stay in the field and follow the path on the left of the wall that follows the road to take a look at one of the waterfalls in Bainbridge. At the main road we turn left and make our way back into the village admiring the waterfall on the left as we cross over the bridge. This is a moderate walk on grass paths, grass and tarmac tracks and on some small roads. There are some steep inclines and declines. The Roman Road is a gradual uphill stony track. Elevation: Lowest point 211.9 metres (695.21 feet) Highest point 501 metres (1643 feet). Approx 8.75 miles allow 3 hours 35 minutes using OS map OL30, Yorkshire Dales Northern and Central areas. Wensleydale, Swaledale. Start point: near the children’s play park and public toilets. Bainbridge in Wensleydale in the Yorkshire Dales. From A1 take the A684 to Bedale. At the t-junction in Bedale turn right for Layburn. At the small roundabout at Layburn turn left and keep following the A684 through Aysgarth to Bainbridge. There is ample road side parking and a small area just next to the children’s play park. Parking is free but a donation can be made for the up keep of the village green. There are public toilets in Bainbridge and for refreshments in there is a pub the Rose and Crown, the Corn Mill tearoom, a butcher, and a shop with post office. There are public toilets, four pubs, cafes, tearooms, takeaways and shops in nearby Hawes. No we did not go in the Rose and Crown as we did not have time but we intend to go soon. We have heard its very nice. We have booked a weeks holiday in may in Bainbridge and I was browsing the web for ideas on local walks. I came across your website and have just viewed your record of the Bainbridge to Semner Water walk. I have earmarked your website for future viewing for further ideas. We stayed over in Finghall last year and enjoyed many local walks using information of the web together with the relevant OS map. Thank you for sharing your experiences and providing information to enable those of us outside your area to fully enjoy what is a wonderful area. Thank you for you lovely comments. We make the videos in our spare time they are mainly aimed at begginers, holiday makers, tourists and anybody who finds it hard to read a map. Would you please pass our website on so that we might be able to help others with their walking. Have a great holiday. I honestly like your way of blogging. I saved it to my bookmark webpage list and will be checking back in the near future.